The Lewes Police Department participated in No Shave November to raise funds for Beebe Healthcare’s Tunnell Cancer Center. Members of the department grew mustaches as part of a nationwide movement to raise cancer awareness by embracing their hair, which many cancer patients lose. 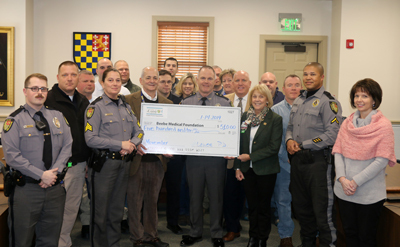 “We are honored that the Lewes Police Department chose Beebe Healthcare’s Tunnell Cancer Center as the beneficiary of their No Shave November fundraiser. The funds raised will benefit cancer patients here in Sussex County. We can’t thank the department enough for their support of Beebe and for keeping our community safe,” said Tom Protack, Vice President of Development, Beebe Medical Foundation. Shown (left to right) are: In front: Ellen Lorrane, Tyrone Woodward, Rich Schazza, Judy Aliquo of Beebe Medical Foundation, Tom Protack of Beebe Medical Foundation, Lewes Police Chief Thomas Spell, Beebe Healthcare President & CEO Jeffrey Fried, Sherri Harmon, Jim Azato, and Anthony Vallenti. In back are Chatham Marsch, Casey Crapps, Jamie Locklear, Jonathan Moyer, Rob Scisco, Sharon Slater, Lenora Dillinger, Jim Bachman, and Brent Layfield. Find out how you can give to Beebe.